I think you’ll be pleased to hear the following snippets of good news. 1. I have been brave. 2. I have pushed myself way out of my comfort zone. 4. I’d do it all again! My first attempt at a two-tiered, fondant covered cake has been a huge success! With the help of Lorraine Pascale’s recipe for red velvet cake and some good forum friends willing to help me step-by-step, it has definitely been challenging. Stressful even. But ultimately worth it. just seeing the look on my daughter’s face has made it worthwhile. Miss decided on a ‘hot pink’ and black cake. I think we achieved the requisite level of ‘hotness’ as it were. I used Wilton’s ‘rose’ gel paste food colour, which I think has helped turn the ready-made (Tesco) fondant a beautiful colour. ..and twirled the wire round one of the dowelling rods used to support the top tier, to get the required curliness. I won’t use the small letter cutters again, they were fiddly and didn’t give me a very professional look, they looked amateurish I think. And the fondant got stuck many times and wouldn’t come out – so much so that I had to make the ‘A’ by hand. If any cake decorators have any ideas for another way of forming letters/names, please, please share them with me! And if you have any ideas for making the cake topping numbers stand up on the cake, without using the same florist’s wire, please also share that jewel of information with me- one of the wires wouldn’t stay in and I almost stuck it straight through the number 2! By this time I was in the throes of stress, my speaking voice had risen by quite a few octaves AND decibels! In the midst of all this my husband came into the kitchen and told me to calm down. Cake making was not meant to be this stressful he said. I ended up apologising to my daughter, and she to me…. In the lined and waiting cake tin. The cake was easy to make and it was weirdly satisfying adding a whole bottle of red (Not ‘natural’ red, says Lorraine!) liquid food colouring to it! Both cakes (9″ and 6″) were split in half before being filled with cream cheese buttercream. I also used the same buttercream to cover the cakes. After the buttercream had set to the touch, I started worrying that I’d let it dry too much and that the fondant wouldn’t stick to the cake – so I heated up some apricot jam in the microwave until it had become liquid and used a silicone brush to paint a thin layer on the cakes, so that the fondant would have something to stick to. I used wooden dowelling in the bottom tier to carry the weight of the top tier, each piece was cut to the same height as the cake and placed in a square formation which would be hidden under the top layer and used a pretty pink ribbon to hide the ‘join’ when I sat it on top. we cut out pink and black hearts of fondant to decorate the cake along with the toppers. It was moist, tender and delicious. Also to Minnie for suggesting I watch Lorraine’s baking programme for ideas and help on making a two-tiered cake. These are, as the title states, incredibly easy, in fact they’re so easy they’re almost more of an assembly job than a recipe. 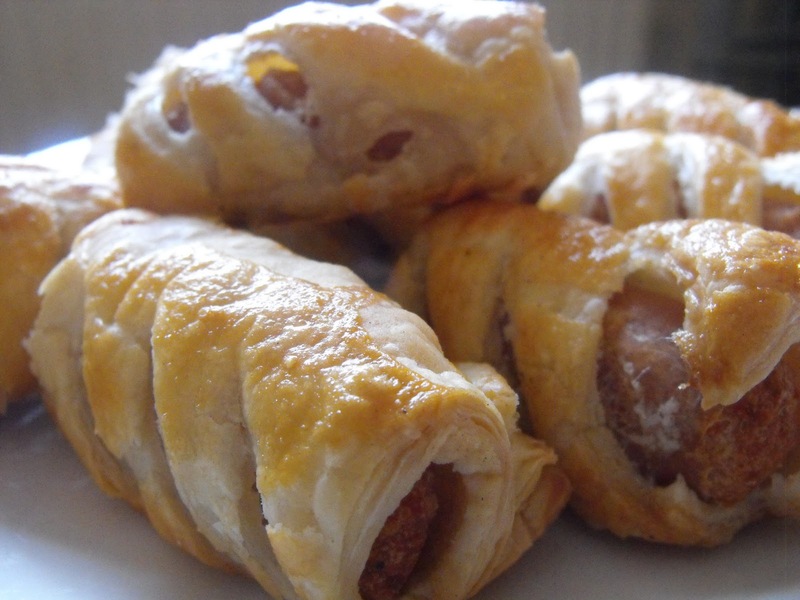 From Lorraine Pascale’s baking book, sausages are simply snipped in half, then rolled up in puff pastry, egg-washed and baked. Incredibly moreish and very tasty, oh and incredibly easy! So easy that I baked a batch to take to son no.2, just because.